Jambiani is situated on the marvellous east coast of Zanzibar between Paje and Makunduchi, 50 km from the capital of the Island Stonetown, direct at the Indian ocean with its coral reefs. We offer transfer from / to the airport of Stonetown or the port in town. All accommodations are situated in a beautiful tropical sandy garden, where you can relax on comfortable sunbeds under paracel. 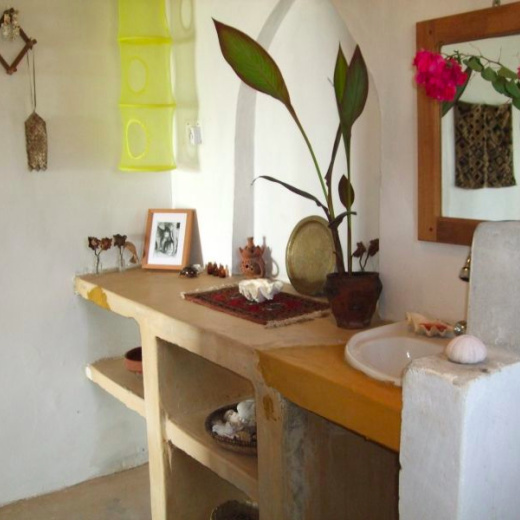 Accommodation include 2 rooms with oceanview, both with attached hot water shower-bathroom and individual veranda. 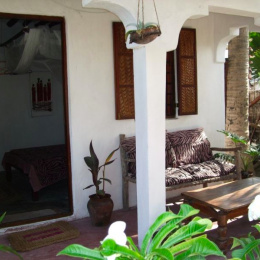 There is also 1 individual Bungalow built in traditional architecture with attached shower-bathroom and veranda. All accommodations are equipped with king-size beds, huge mosquito nets, fans and fly-screens at the windows. The verandas are furnished. As a beachhouse we offer specially for self caterers or families with children both rooms with 2 shower-bathrooms and 2 verandas and a kitchen. Room service is included. Feel invited to Kiddo´s Café and try one of the tasty fruitcocktails, fruitsalads, sandwiches, homemade cakes or just enjoy the terrific sea view. If you order in advance there is the possibility to have lunch and dinner African, Indian or European style either in the Café or in the garden.